Everyone’s gone pumpkins lately, and can you really blame them, ’tis the season after all. While I’ve managed to get my hands on some kabocha and butternut squash, pumpkin is hard to come by in Italy, so I haven’t yet had the pleasure myself this season, but I’ve been admiring from the screen as some of my favourite bloggers have gone pumpkin wild. From Jessie’s Nutella Swirl Pumpkin Bread to Natalie’s Vegan Pumpkin Crème Brulée, Sophia’s Pumpkin Molasses Cupcakes, Audrey’s Pumpkin Spice Porridge, Gena’s Skillet Pumpkin Cornbread and Brandi’s Pumpkin Spice Sauce. So many amazing recipes to try, if I could just get my hands on some pumpkin. At some point I might cave and buy an overpriced can or two of Libby’s from THE ONE supermarket in Milan that sells North American products. In the meantime I’ve gone apple crazy. Apples are one of those fruits you can enjoy year round but they’re always best and most fresh this time of year just after they’ve been picked. Nothing beats eating in season. 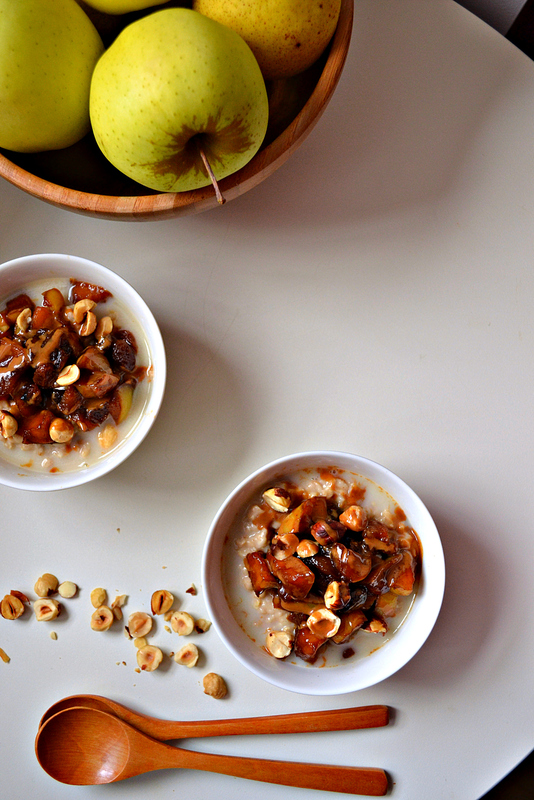 Let’s have a word to two about comforting porridge and the importance of breakfast. We hear it over and over again, breakfast is the most important meal of the day. I don’t quite agree with this statement 100% in the sense that all meals are important, for different reasons. As are snacks. What makes breakfast so special however is that it helps kick start our metabolism and gets our stomachs churning to get those digestive juices going. Good health starts with good digestion, and good digestion starts with a healthy and nutritious breakfast. Ideally, a glass of warm lemon water on an empty stomach, 20 minutes before you eat anything, is the perfect way to stimulate those digestive juices. It tricks your digestive system into thinking that it’s time to start working but since there’s very little digestion needed for a glass of lemon water, your hard working stomach will have already done a great deal of work and will reap the benefits for the rest of the day. Talk about efficiency and productivity. If you’re body were a corporation you’d be ready to give that stomach of yours a raise and maybe even a promotion. Once you’re ready for your first meal, it’s important to chose wisely and oatmeal is a particularly great choice. Oats are high in fiber and protein and a great source of slow releasing complex carbohydrates that will keep you going until your next meal. Oats are also higher in fat content than most other grains, which makes them the perfect food in the cooler months, as they warm the body and give you energy. I generally opt for rolled oats which cook up rather quickly into a creamy porridge and make a great bircher muesli. When it comes to porridge, oats are the superstar, but you could also replace those oats with other nutritious whole grains like buckwheat, amaranth, quinoa, millet or even mix them all up. The combinations and permutations are endless. Especially when it comes to toppings. 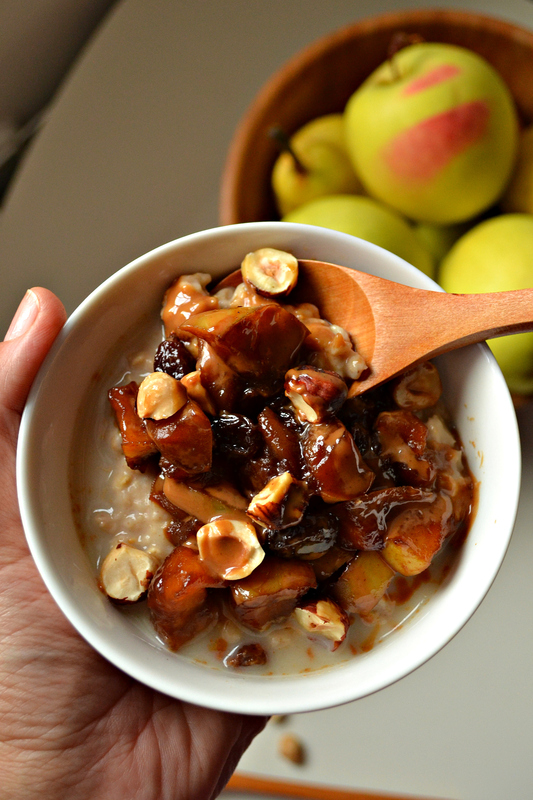 This Caramel Apple Breakfast Bowl is slightly more decadent than what I’m used to for breakfast. I would normally just stew my apples without any sweetener at all, but I wanted to bring something extra special to the table today. 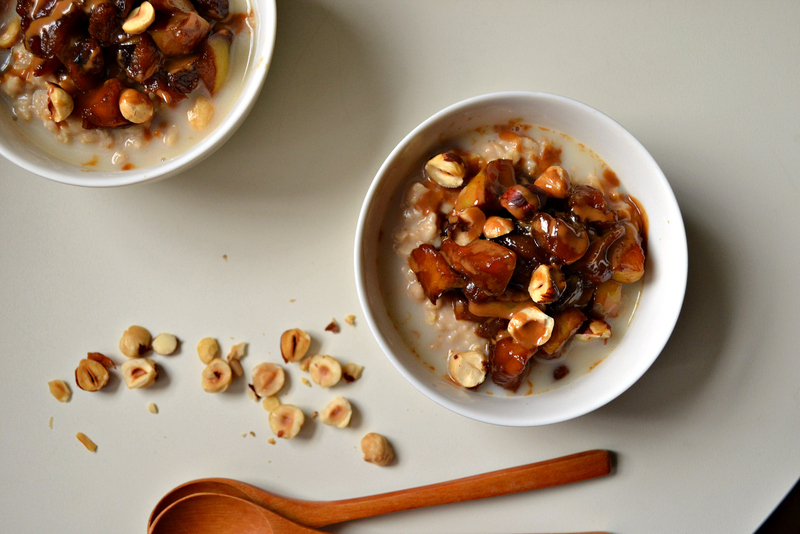 It’s exactly how it sounds, a bowl of porridge topped with the most decadent of stewed coconut sugar caramelized apples and crunchy toasted hazelnuts. This concoction as you may have guessed is quite reminiscent of the infamous apple on a stick bathed in caramel sauce and rolled in nuts, but much healthier and still worthy of your sweet tooth. I myself can only handle a small amount of this at a time so I labeled the recipe as two servings, but if your sweet tooth is more naughty than mine, you just might want to eat the whole thing. This breakfast bowl is quite decadent but loaded with nutrients to help you start your day off right. 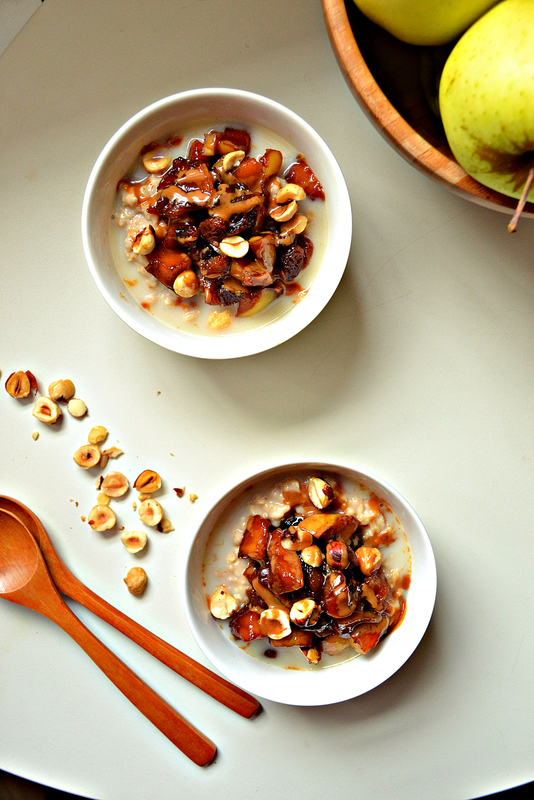 Rolled oats are cooked and topped with apples that are stewed and caramelized with coconut sugar, cinnamon and raisins for a flavour reminiscent of the Caramel Apple. The bowl is topped off with a drizzle of creamy hazelnut butter and crunchy roasted hazelnuts, and served with oat milk. Place rolled oats and water in a pot and bring to a boil. Add cinnamon, reduce heat and let simmer, stirring frequently, until the oats are soft and creamy, about 15 minutes. Stir in hazelnut butter and oat milk. In the meantime, add all caramel apple ingredients to a pan or small pot and stir to combine. Let cook over medium heat about 10 minutes until apples are soft and the liquid has caramelized. Transfer porridge to serving bowl(s), top with caramel apple mixture, a drizzle of hazelnut butter, some chopped roasted hazelnuts and serve with oat milk, as desired. Thanks Audrey. Yeah pumpkin is really tough to find here. You can get all sorts of squash, albeit not spaghetti squash…I have yet to find it here. Last year I did find some huge carving pumpkins around Halloween but that’s it. I typically use a sweet squash to replace the pumpkin in dessert making, hence the inventive uses I’ve had for kabocha. And when I absolutely must have pumpkin I cave and buy the canned stuff eventhough I generally prefer not to eat out of a can and I find 6 euros a can to be a bit exorbitant. How much is a can of pumpkin puree in Canada? I can’t remember the prices anymore. Thank you Rami. I hope you try it out. It’s like dessert for breakfast without the guilt. Thank you so much for mentioning my Pumpkin Spice Sauce! I am so behind on comments, I just saw the linkup. This caramel apple breakfast bowl looks amazing and considering apples are my absolutely favorite fruit, I can never get enough!! So much flavor here. Oh goodness Brandi that sauce is hard not to mention. This is really a treat and so simple it’s almost wrong to call it a recipe but it’s so so so flavourful and decadent that I had to share it. Apples are one of my favourites too, just to munch on or cooked/baked into recipes. Thanks Kathryn! I’ve always gravitated to apples, pears, plums and squash for fall myself and less so pumpkins eventhough I guess they’re part of the squash family. Porridge in general has endless possibilities doesn’t it…the combinations and permutations of grains and fruits is endless. I just love it.